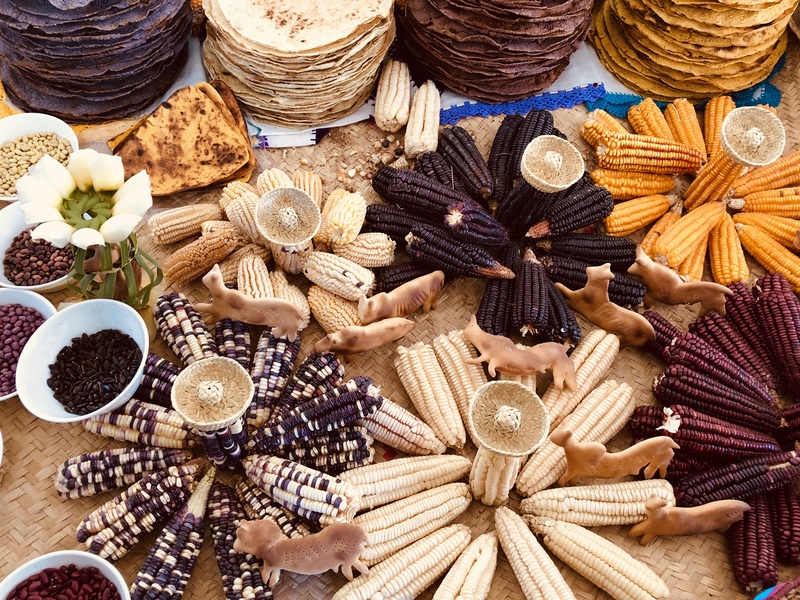 Oaxaca celebrates indigenous food and handmade at the annual Agro-biodiversity Fair in Ejido Union Zapata. This once a year event is building traction. The main street of several blocks, cordoned off for booths and foot traffic, was packed by noon. The natural food color was beyond belief. 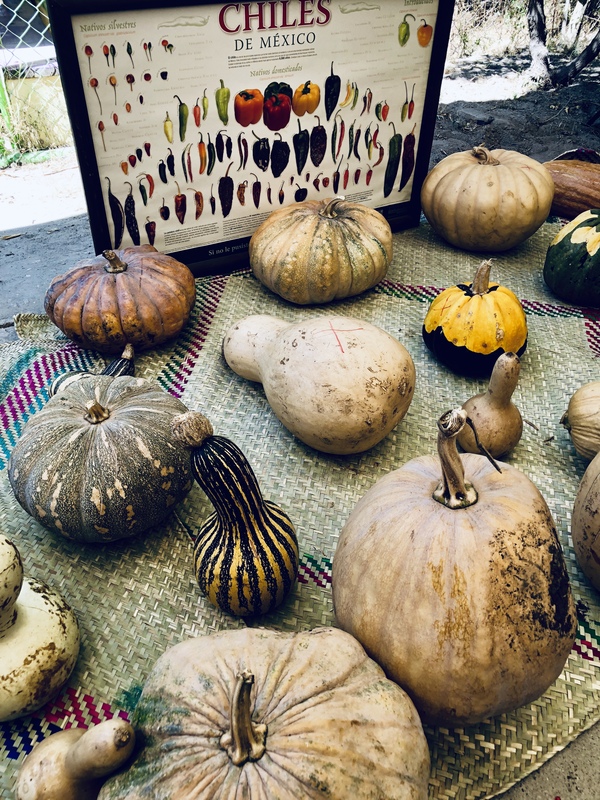 Billed as a seed exchange, farmers came from as far away as Chiapas, the Coast of Oaxaca and the Mixteca Alta, the high mountain range that borders the states of Oaxaca and Guerrero. Weavers working in natural dyes and mask makers joined in. 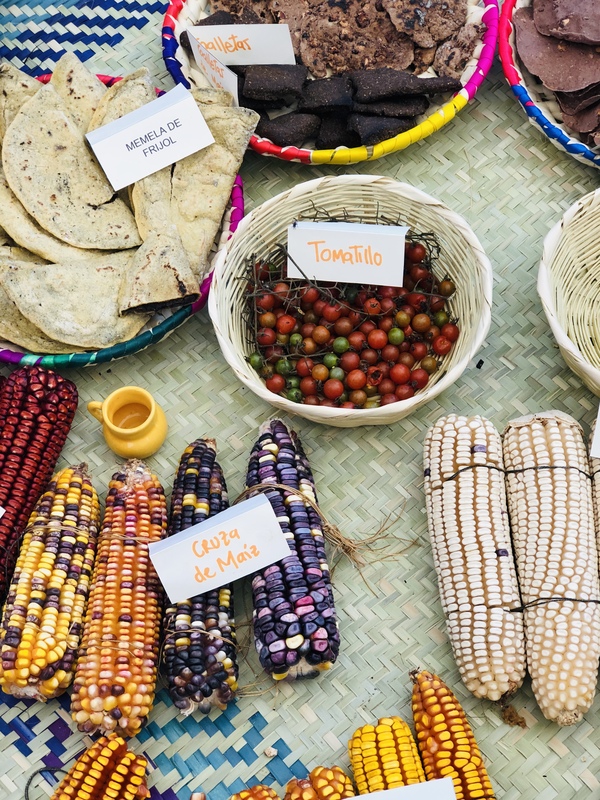 For sale were seeds, fruit, vegetables, flowers, tortillas and tamales. 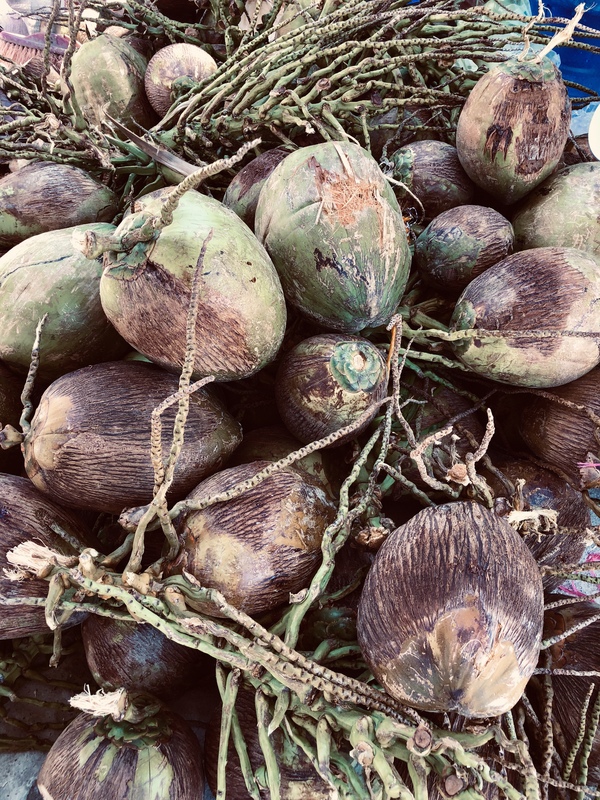 Coconut from Oaxaca’s coast. Have you tasted coconut crackers? Fitting for Thanksgiving Weekend, it was a day of plenty. 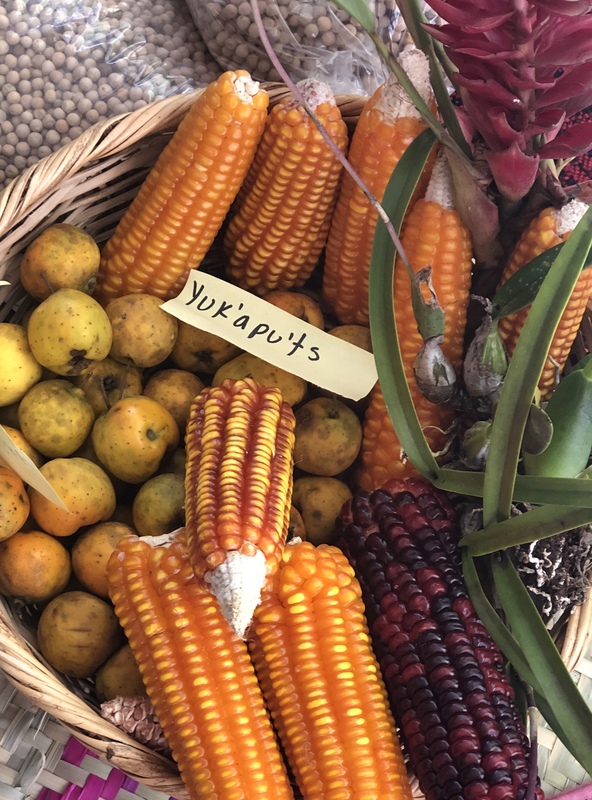 There is a big and growing movement in politically active Oaxaca to conserve native food: chiles, tomatoes, corn, peppers, squash, coffee, chocolate, amaranth, jicama and more. There are so many different varieties of each. One of the leaders, Rafael Meir, was present along with government representatives of Oaxaca and Mexico. 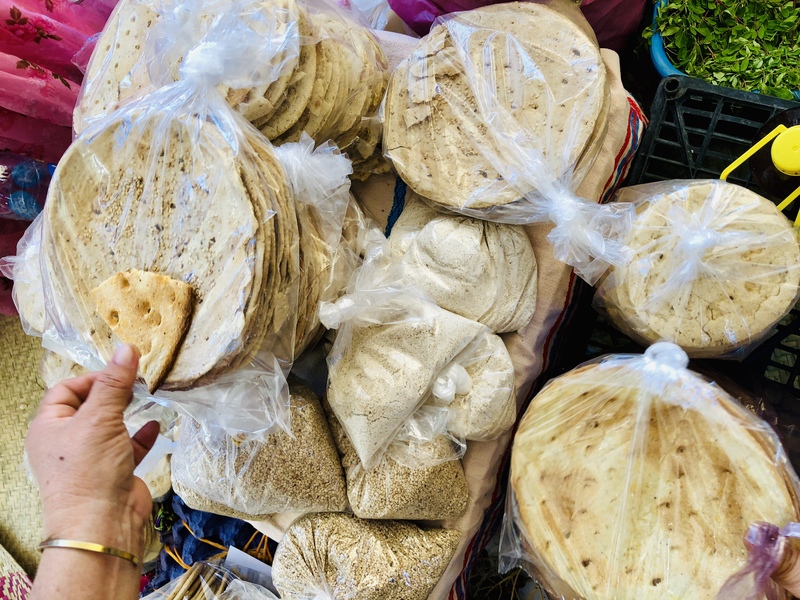 Leaders are becoming more conscious about the importance of keeping GMO contained to what has already infiltrated the commercial tortilla business. Yet, there is still much more to do. Public education has so much to do with the success of programs like this one. House made sesame crackers — yummy, or buy seeds and make your own. I was so happy to see Yuridia Lorenzo and her mom, Alegoria Lorenzo Quiroz from the Colectivo Jini Nuu in San Juan Colorado. 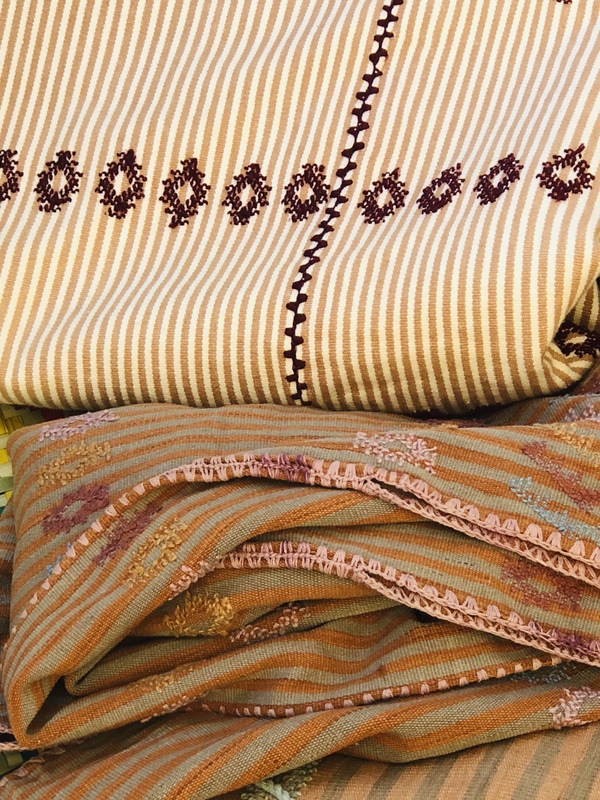 They were selling their beautiful blouses and dresses made with native coyuchi, white and green cotton and natural dyes. 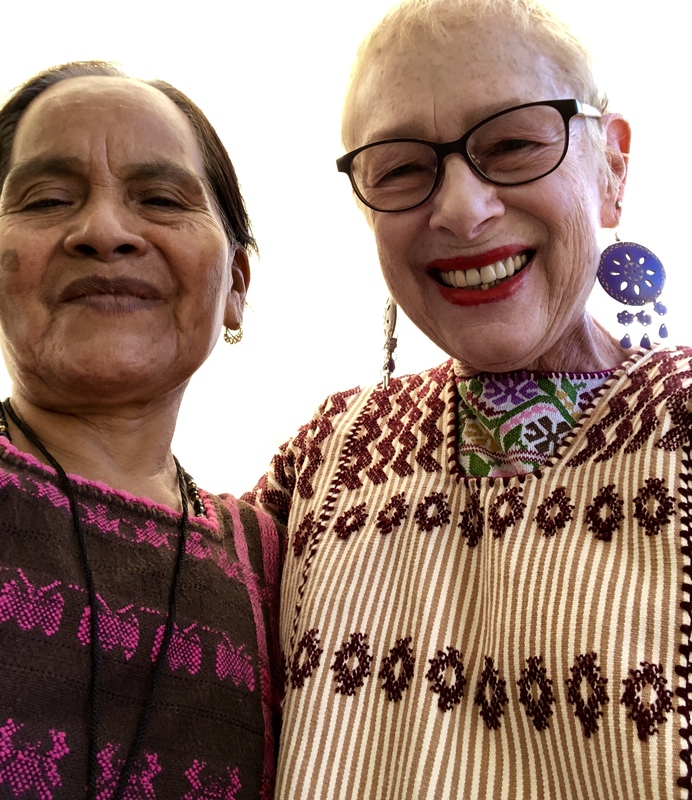 Participants in my Oaxaca Coast Textile Study Tour will visit them in mid-January. Alegoria Lorenzo Quiroz and me. If you missed it, I hope you will mark your calendar for next year. Although the dates may float, so I’m not sure exactly when it will be held. Check out these Facebook pages to keep track: Rafael Meir, who is director of Fundacion Tortilla de Maiz Mexicana. Watch a VIDEO of the fair. 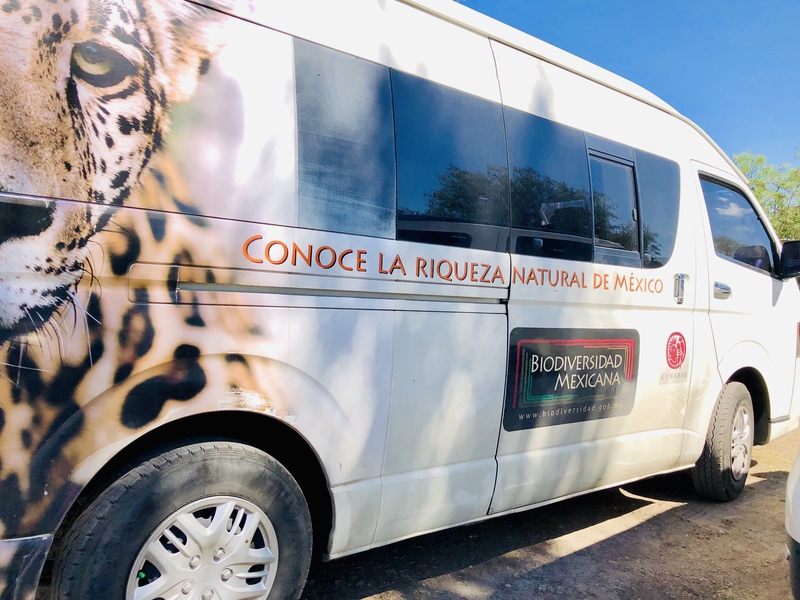 Another benefit of attending is to taste and buy mezcal, Oaxaca’s organic, artisanal alcoholic beverage distilled from fermented agave. I bought a bottle of sylvestre (wild) jabali mezcal grown and distilled in Teozacoalco in the Mixteca Alta by Mezcalero Javier Cruz. Que Rico! 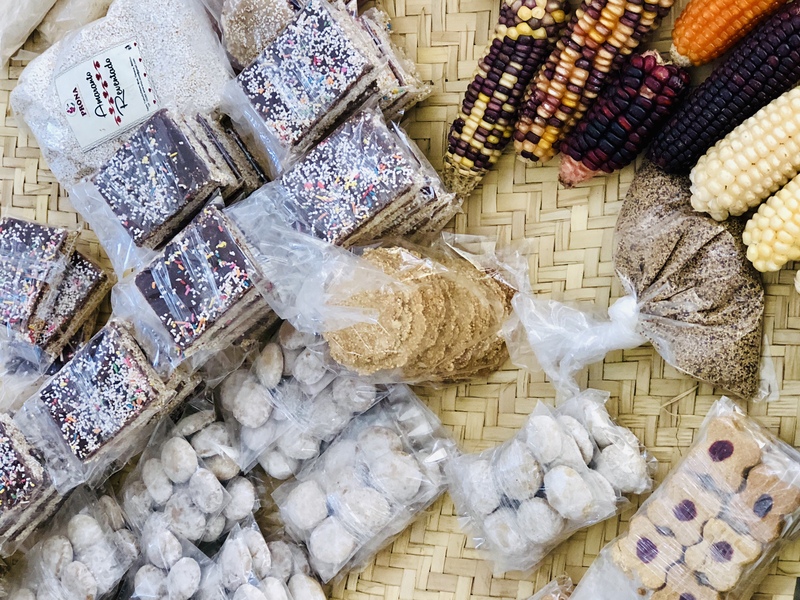 I’m noticing that Oaxaca is becoming inundated with foodies and followers of What’s Hot on the food and beverage scene. We’ve got free walking tours led by guides holding colorful umbrellas and flags downtown who get paid with tips. We have USA restauranteurs coming for cooking classes to bring the cuisine home. Rent prices are escalating in the historic center. If one lives on the peso, everything is at a premium now. 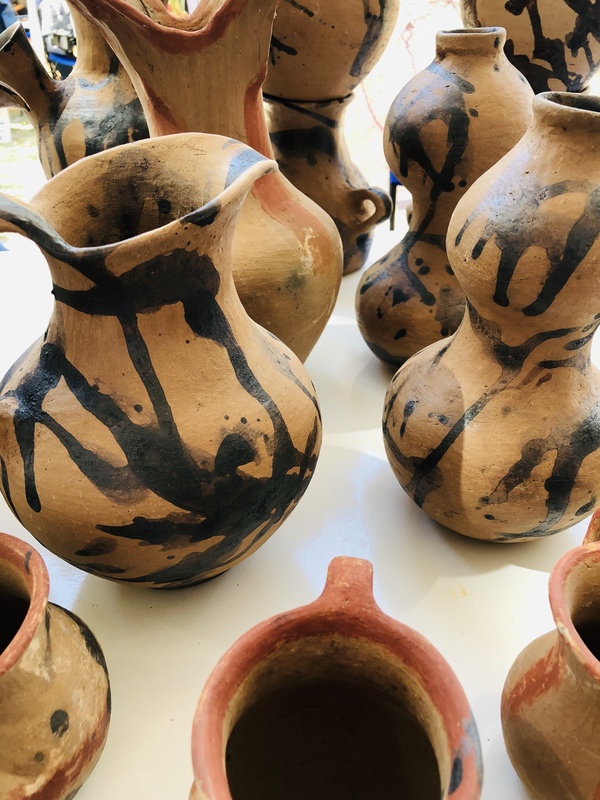 Those of us who live here always ask if the influx of tourist dollars trickles down to the pueblos, the makers, the field and kitchen workers. What is your experience? Back-strap loomed wool, San Pablo Villa de Mitla, corn, snake, cacao symbols. 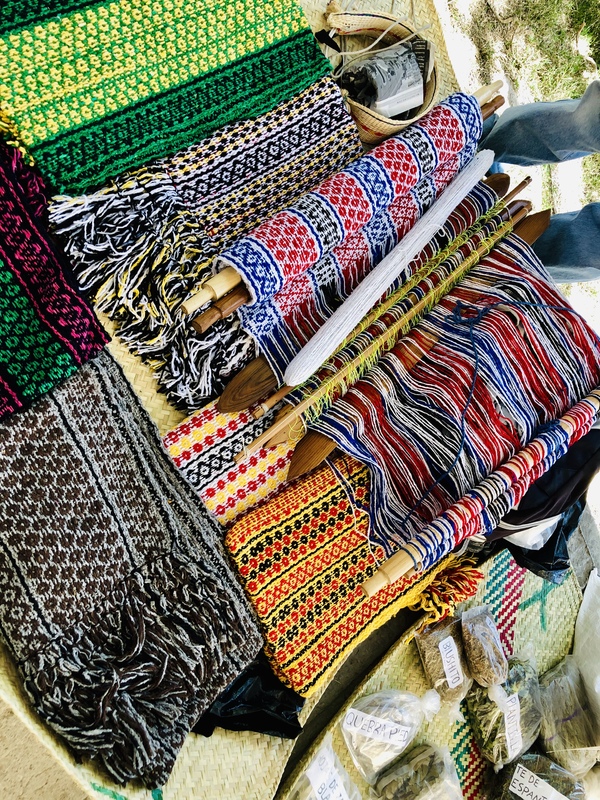 That’s why fairs like this one are so important — to buy direct from those who produce. Slow food. Slow fashion. Slow mezcal. Saludos. 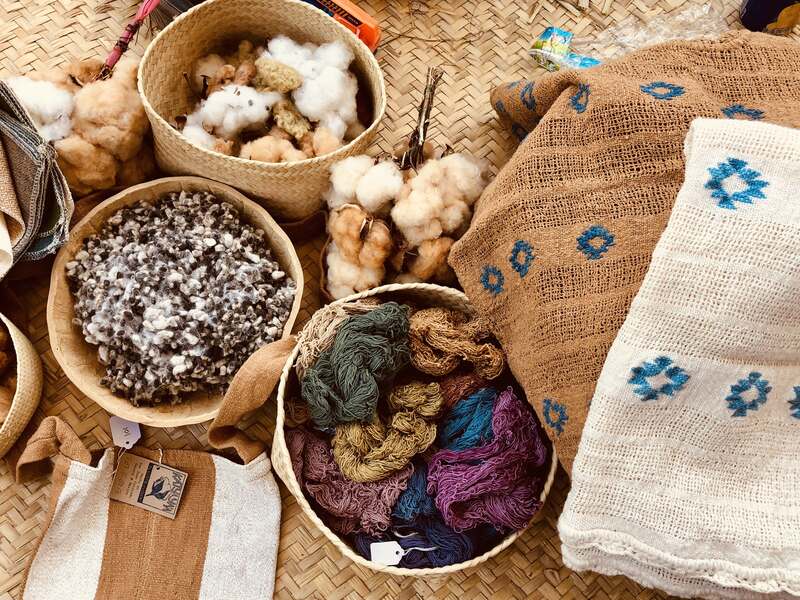 This entry was posted in Cultural Commentary, Oaxaca Mexico art and culture, Photography, Textiles, Tapestries & Weaving, Travel & Tourism and tagged agriculture, biodiversity, fair, Mexico, native food, Oaxaca, slow fashion, slow food, Union Zapata. Bookmark the permalink. Hi, Kris. Thanks for your interest. Yes, the 2019 trip is full. I’m not sure what the schedule will be yet for 2020. If we repeat the coast trip, I will notify you.